The Kenyan Independent Electoral and Boundaries Commission prepares to announce election results at the Bomas of Kenya, in Nairobi, Aug. 11, 2017. Kenya's opposition said Friday that it would "not be a party" to the election commission's imminent announcement of the result of the presidential vote because its concerns had not been addressed. Provisional results from polling stations showed President Uhuru Kenyatta with a lead of 1.4 million votes in his bid for a second and final five-year term. Opposition candidate Raila Odinga's camp has disputed the count and said it would accept the election result only if allowed to see raw data on the commission's computer servers. Odinga has lost the last two elections, claiming fraud in both cases. Many Kenyans fear a repeat of the violence that followed the 2007 contested election, when about 1,200 people were killed and hundreds of thousands displaced as political protests led to ethnic killings. "We raised some very serious concerns; they have not responded to them. As NASA [the opposition coalition], we shall not be party to the process they are about to make," senior opposition official Musalia Mudavadi said. James Orengo, chief election agent for the opposition coalition, said: "This has been an entire charade," adding: "The Kenyan people have never disappointed ... every time an election has been stolen, the Kenyan people have stood up to make sure changes are made to make Kenya a better place. "Going to court, for us, is not an alternative. We have been there before." Earlier, Orengo had called for the candidates and observers to be given access to the election commission's servers so there could be a transparent audit of data from 41,000 polling stations across the country. Yakub Guliye, election commissioner in charge of information technology, said that the opposition had not made a formal request and that the commission would not act on a verbal request. Normal procedure calls for the commission to release final results after cross-checking its electronic tally with paper forms. Odinga's camp has said figures released by the commission since Tuesday's vote were "fictitious" and that "confidential sources" within the commission had provided figures showing Odinga had a large lead in the race. Police had beefed up security across much of Kenya — particularly in opposition strongholds in the west and parts of Nairobi — in anticipation of the announcing of the election result Friday. 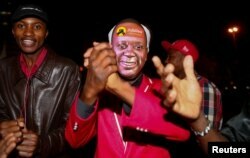 Supporters of Kenya's President Uhuru Kenyatta celebrate ahead of the announcement of election results in Nairobi, Aug. 11, 2017. At an international conference center, ruling party supporters sang, "Today is our day, God is good," as the president arrived to address them. Kenya is the leading economy in East Africa, and any instability would be likely to ripple through the region. Odinga is a member of the Luo, an ethnic group from the west of the country that has long said it is excluded from power. Kenyatta is from the Kikuyu group, which has supplied three of four presidents since Kenya gained independence from Britain in 1963.
International observers have given the thumbs-up to the vote. U.S. Ambassador Robert Godec issued a statement on behalf of the diplomatic community calling for any complaints to be channeled through the courts, not street protests. "If there are disputes or disagreements, the Kenyan constitution is very clear on how they are to be addressed. Violence must never be an option," he said Friday. But the opposition criticized foreign observers. "The observers largely served the interests of the government," Orengo said.